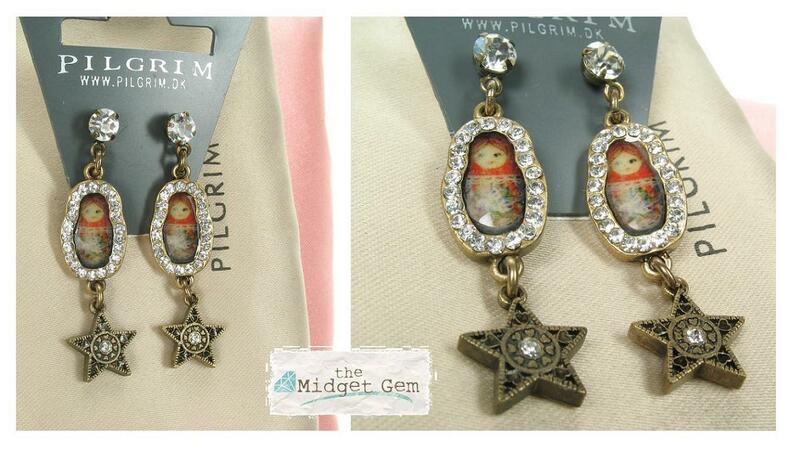 The 224 'Babushka' series is Pilgrim's most iconic with beautiful Russian dolls encrusted with Swarovski crystals and stars. The metal work (except the black) has a vintaged patina and it is burnished/oxidized which gives it a lovely aged feel. It is a very early vintage series, which carries the original round logo tag. This is highly sought after and we have very limited stock available. We do have some other items in this series and in other colours. Contact us via email for details. Two doll necklace. Russian dolls measure 2.5 cm/25 mm and 1.8 cm/18 mm. Length of front drop 6.5 cm/65 mm. Adjustable length 36 cm/14 inches to 43 cm/17 inches. Very rare item. 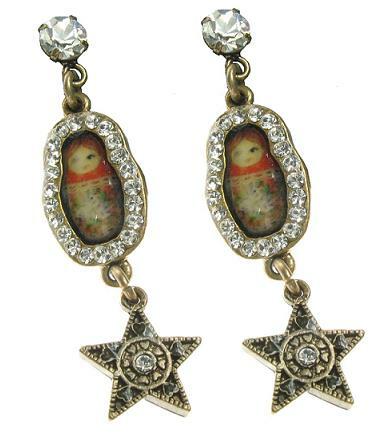 Russian Doll & star earrings (224 013). Burnished gold plate & clear Swarovski crystals. Russian dolls measure 1.5cm/15mm. Total length 4.5cm/45mm. Pierced ears. Very rare item. 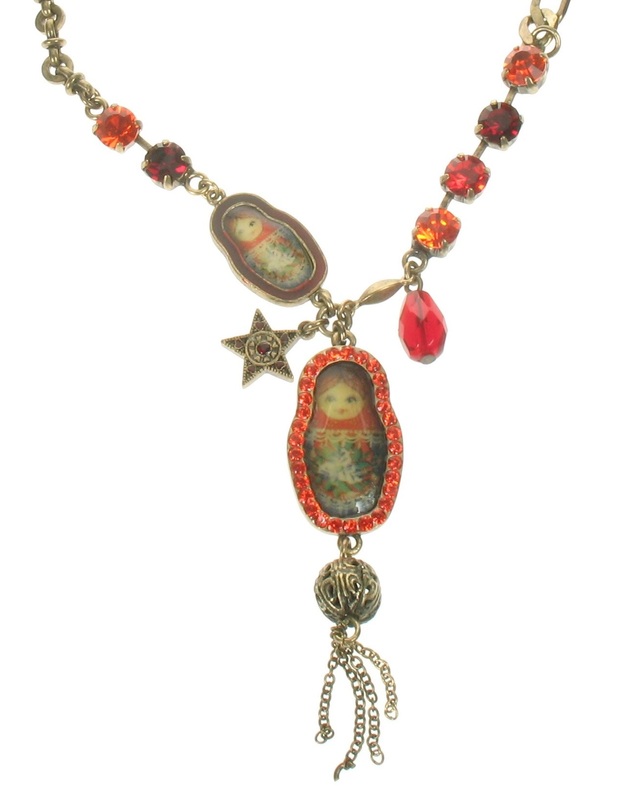 Single doll necklace (224 011). Burnished gold plate & clear Swarovski crystals. Russian doll measures 2cm/20mm. Length of front drop/pendant 6cm/60mm. Adjustable length 36cm/14 inches to 43cm/17 inches. Three doll charm bracelet (224 002). Burnished gold plate & clear Swarovski crystals. Russian dolls measure 2cm/20mm and 1.8cm/18mm. Length of front drop 6.5cm/65mm. Adjustable length 16.5cm/6.5 inches to 23cm/9 inches. Very rare item. 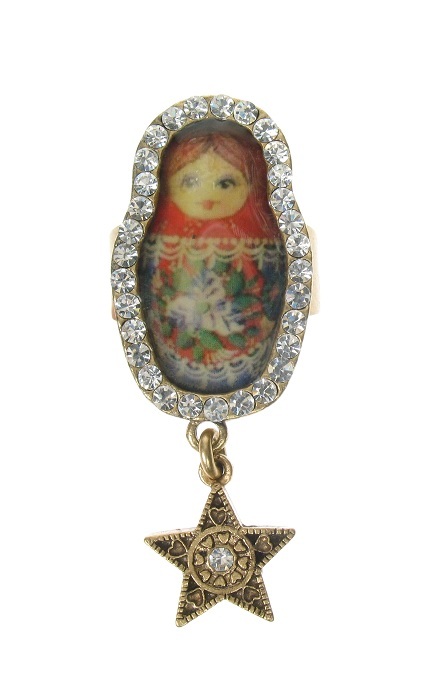 Russian Doll & star ring. Burnished gold plate & clear Swarovski crystals. 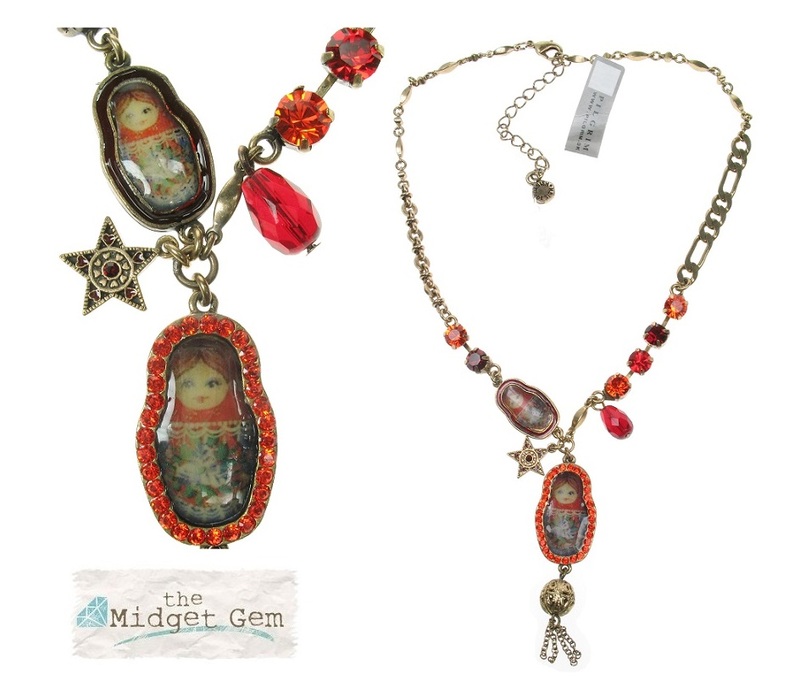 Russian dolls measure 1.5cm/15mm. Total length of decoration 4cm/40mm. Doll is 1.5cm/15mm wide. Ring band 8mm wide (tapers to the back). Very rare item. Adjustable size. 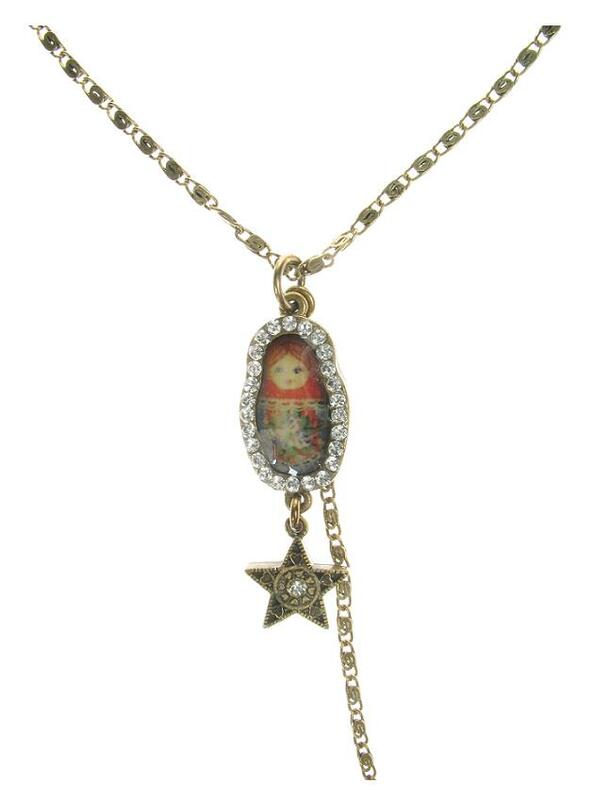 Large single doll pendant long necklace (224 031). Russian doll measures 4.7cm/47mm. Length of the pendant is 12.8cm/128mm. This necklace can be worn at different lengths: long or doubled-up for a shorter length. Length 31 inches/79cm to an adjustable 34 inches/87cm. The one pictured is in burnished (oxidised) dark gold plate & clear Swarovski crystals. 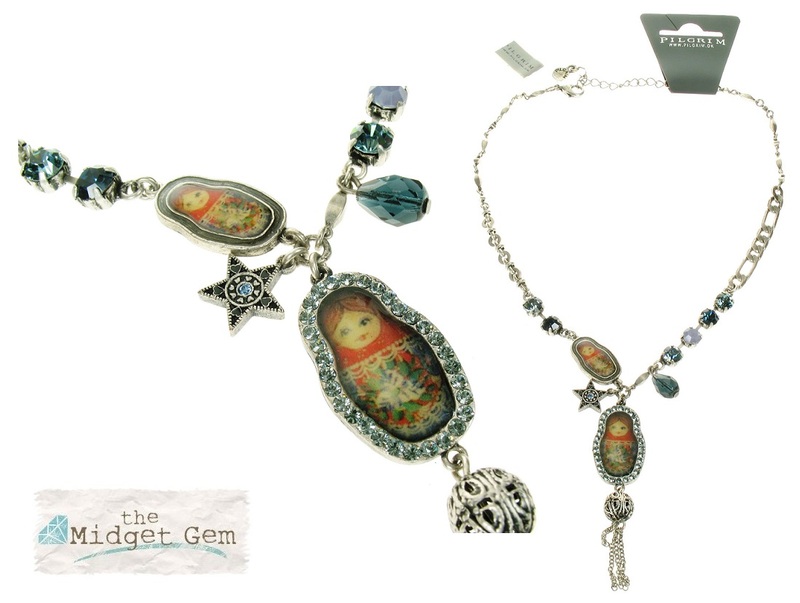 Large single doll, with filigree ball and star drop pendant hung on a long chain. 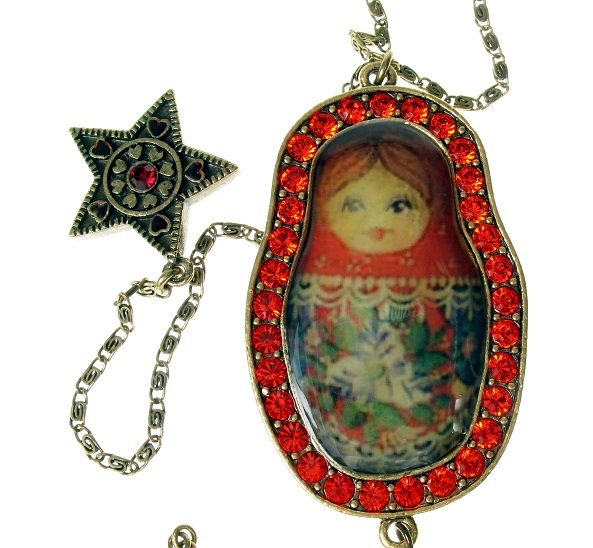 The Russian doll measures 4.7 cm/47 mm. Total length of the pendant is 12.8 cm/128 mm. This necklace can be worn at different lengths: long or doubled-up for a shorter length. Length 31 inches/79 cm to an adjustable 34 inches/87 cm. The one pictured is in burnished (oxidised) silver/blue. 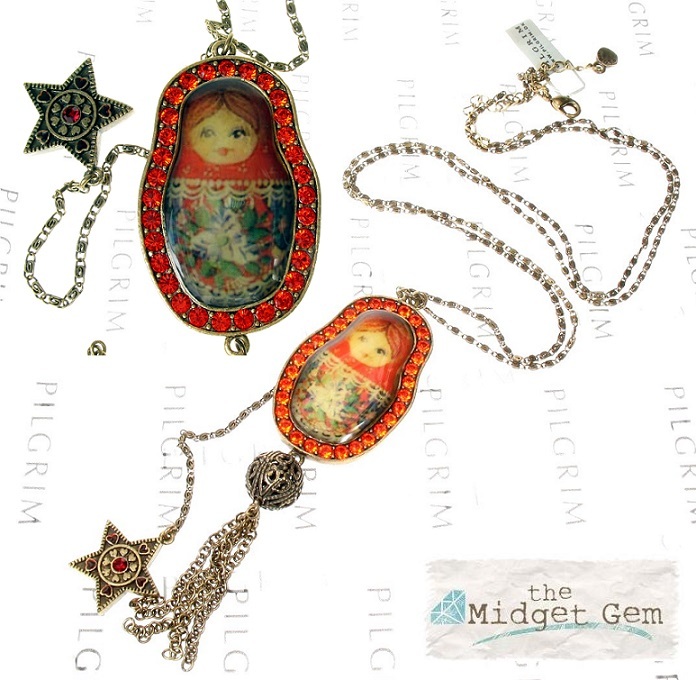 Large single doll pendant long necklace (224 031). Russian doll measures 4.7 cm/47 mm. Length of the pendant is 12.8 cm/128 mm. The one pictured is in burnished (oxidised) dark gold plate & red Swarovski crystals. This is quite a rare colour now and we only have a couple left. Oxidised gold plate, red Swarovski crystals and enamel. Two doll necklace. Russian dolls measure 2.5 cm/25 mm and 1.8 cm/18 mm. Length of front drop 6.5 cm/65 mm. Adjustable length 36 cm/14 inches to 43 cm/17 inches. Very rare item. Oxidised silver plate, blue/grey Swarovski crystals and enamel. Two doll necklace. Russian dolls measure 2.5 cm/25 mm and 1.8 cm/18 mm. Length of front drop 6.5 cm/65 mm. Adjustable length 36 cm/14 inches to 43 cm/17 inches. Very rare item.